After cleaning, shoes can be treated with cream and wax. You should choose a cream and a wax that are specifically for the leather and colour of your shoes. With the help of a cloth, apply the cream on the surface to be treated. This process can be carried out on the internal and external parts of the shoe. Proceed in the same way with the wax on the outside area of the shoes only. 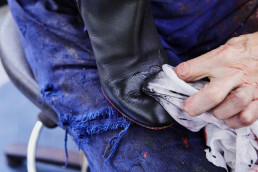 After several minutes, polish with the help of a polishing brush to rediscover the original shine of the leather. For optimal protection, you can also waterproof after the waxing stage.